US, 1981, 93 minutes, Colour. Dudley Moore, Liza Minnelli, John Gielgud, Geraldine Fitzgerald, Stephen Elliot. Arthur was a very popular comedy of 1981. Dudley Moore achieved success in England, especially in stage and television review with Peter Cook. He is also an excellent musician. These talents were to the fore especially in Bedazzled. Moore made a hit in the United States in Blake Edwards' '10', followed it with Wholly Moses and achieved another success with Arthur. Liza Minnelli is a vivacious heroine and John Gielgud is able to bring his Shakespearian and stage experience to the snob valet role of Hobson, winning an Oscar. The film is a light fable about wealth and happiness. It was written and directed by television writer Steve Gordon. 1. A pleasing comedy? Comedy and its view of life, characters, situations? Verbal and visual humour? The American tradition - direct and less subtle? Comedy for laughter, comedy for point? The impact of the comedy in Arthur? 2. The film as a Dudley Moore vehicle: his presence, appearance, shortness? English style? Comic style and persona? The little man, eliciting audience sympathy? Moore as a good actor evoking his character and asking compassion? His skill with verbal humour? Musical talent? His being matched with Liza Minnelli and her strength and vivacity? John Gielgud with his suave and smooth delivery? A satisfying comic blend? 3. The New York background: the credits song and lyrics? Wealthy New York and the contrast with Queen's? The ordinary and the extraordinary world? The particularly American tone of Arthur? 4. Arthur as likable, initially laughing, drunk? Audiences laughing at him and then with him? Feeling sorry for him? The credits laughter, his chauffeur and the wry comments he made throughout the film - and the friendliness at the end? The comedy with the picking up of Gloria with the one liners and others laughing? Falling out of the car, the restaurant and his talking with his aunt and uncle? The enjoyment of the meal with Gloria? The night with her - and the toy trains? The background to his life, wealth, drinking, not growing up? 5. John Gielgud's impact as Hobson? Gielgud's theatrical style, delivery? presence? Snob - with a touch of the vulgar? His response to Gloria and ousting her? His reprimanding Arthur and treating him like a child? The bath? Reading the paper? The visit to Arthur's father and Hobson's cracks at the assistants? The shopping spree? His manner of reprimanding Arthur and correcting him? Urging him to grow up, yet protecting him? His reading and imitation of dying? The discussion with Linda and his ) offensive remarks. taking them back? His visit to Linda and persuading her to go to the party? The warmth of the sequence with Liza Minnelli? His going to hospital? Arthur's spoiling him, the opening of the gifts - and the Texan hat and Hobson not wanting to be remembered with his hat on? The final sequences? Hobson as a substitute father for Arthur? The impact of his death? His love for Arthur, fathering him? John Gielgud's contribution to this character? 6. Arthur and his drifting, the criticisms of his grandmother, of his father, the pressures for the marriage to Susan Johnson, Johnson and his violent pressurising? The threat of being cut off? His defying his father by the buying spree? The fascination with Linda shoplifting, saving her? Falling in love, infatuation? The outing - the restaurant and the zealous musicians? His being a coward about his engagement and phoning her? The party and his finding her there, his talk with her in the stables, the bond between them? Her telling the Harold story to let him off? His being affected by the death of Hobson? His drinking again? The visit to the cafe and proposing to Linda? The influence of Hobson and his being ready to give up the money for her? 7. Linda and her shoplifting, the scene in the street, the drive home in Arthur's car and the chauffeur ushering her out for the benefit of the neighbours? The character sketch of her father and his poverty, his eagerness to see Arthur and his eagerness to get his money? The outing and her enjoyment of it, her shortness with Arthur on the phone about his engagement, her presence at the party and put-on manner, the stable sequence and her falling in love with him, saving face with Susan, accepting him at work in the cafe? 8. The portrait of Arthur's father and his business success, despising Arthur as weak? The blackmail about the marriage? His grandmother and her art collection, her ruthlessness, strong language? Presence at the engagement? Johnson and his story about making himself everything from nothing and his violent threats? His comments on drinking? 9. Susan and her wanting to help Arthur, the engagement sequence in the restaurant and her keeping her composure? The party? Her sweetness towards Linda? The preparation for the marriage - and her disappointment and fleeing from the church? 10. The fiasco of the wedding - the guests in the church, Arthur and Linda questioning the lady with the hat, the rumpus in the room and the fight with Johnson? Johnson and the knife? The farcical comedy? 11. The aftermath and the truth? Their sitting on the altar steps after Arthur made his speech? Willingness to give up the money? Marshals sitting and listening? Her offering the money? The irony of giving it up - and getting it back? 12. 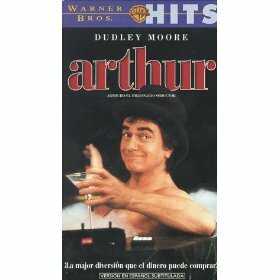 The comedy about drinking - Dudley Moore's skill at presenting the alcoholic Arthur - in the beginning, the visit to Johnson, the wedding sequence? The observation of people and contemporary society? Themes of purpose in life, happiness, love, power, ruthlessness, wealth and poverty? A pleasant fable?